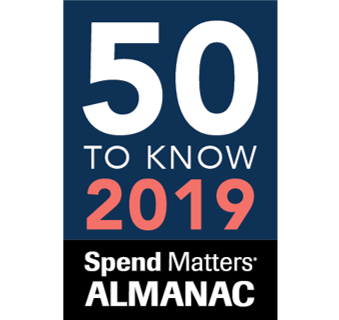 Spend Matters announced its 6th annual ‘50 Providers to Know/50 Providers to Watch’ lists in conjunction with the annual ISM conference taking place in Houston, Texas. Synertrade appears in this prestigious list for the third time in a row. The Spend Matters 50 Procurement Providers to Know list highlights solution providers who lead the charge on new procurement technologies and services, setting the industry standard. Vendors listed are independently selected by the Spend Matters analyst team based on each procurement solution provider’s merits and much internal debate. “For the third year, SynerTrade is recognized by Spend Matters. This list is the product of intense discussion and refinement each year by Spend Matters analysts and it’s difficult to make it further: we’re thrilled SynerTrade made it again this year ! We try to always fit to the procurement evolutions and the market needs with our Digital Procurement solutions and we are honoured that our efforts and vision are recognized by both the market and the analyst community . Another good news in a period of extremely dynamic growth for our company!” says Eberhard Aust, CEO and founder at SynerTrade. This recognition is another great achievement in Synertrade’s period of strong growth. After a double digit growth in 2018, especially in North-America where the company has doubled sales last year, Synertrade is targeting new heights in 2019. Recently created subsidiaries in Italy and Iberica outpace the general market development and, similarly, there has been a double digit new business increase in the existing markets France, Germany, Switzerland, Austria and Nordics in 2018. Synertrade has also made a success of its Middle East launch, winning business against legacy eProcurement players in this area. With +700 customers worldwide, Synertrade is a leading global provider of digital procurement solutions. Its cloud-based platform, Synertrade ACCELERATE, covers the entire purchasing process thanks to a set of easy to use, flexible applications Synertrade ACCELERATE is a complete eProcurement Suite that manages +600 billion $ spend each year, and widens the performance of Procurement and Finance departments in companies such as Luft¬hansa, Schneider, Campari, Alstom, T-Systems, Sanofi, Metro Group, Google, AGCO, LSG Sky Chefs, Walmart and the World Bank. With 22 offices worldwide and a 24/7 assistance in 10 languages, Synertrade brings real expertise and a local service to its customers to optimize their purchasing processes around Source to Contract, Procure to Pay, SRM (Supplier Relationship Management), spend analysis and Purchasing Intelligence. Synertrade is one of the entities of the Econocom Group.